Bheem loves laddoos and how! Watch him win the most favorite competition among kids! The children travel to Atlantis - an under water kingdom, when the sea mermaid asks them for help to save her father. They encounter flying creatures, dangerous objects in the sea, but overcome all and return safely to Dholakpur. A vampire has woken from his sleep after thousands of years and is creating havoc. 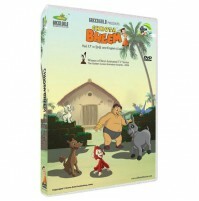 Dhuni baba helps Bheem, and he along with his team save his kingdom once again!